I'm very pleased with the level of acceptance of SSDs today. When the X25-M first hit the market and even for the year that followed, any positive SSD recommendation was followed by a discussion of how many VelociRaptors you could RAID together for the same price as one SSD. Now we have an entire category of notebooks that come standard with some degree of solid state storage. End users are much more accepting of SSDs in general, aided by the fact that prices have finally dropped very close to the magical $1/GB marker (a boundary I expect us to finally cross by the end of 2012). Today's SSDs are not only more prevalent than those we were reviewing just a couple of years ago, they're also a lot better. While the first SSDs still had difficulties competing with mechanical storage for sequential transfers, modern SSDs are several times faster even in the most HDD-friendly workloads. The implementation of technologies such as TRIM helps ensure the performance degradation issues of the very first drives are less likely to be encountered by anyone with a normal client workload. Although it helped shape the client SSD business, Intel's drives are no longer the only option for performance and reliability. There are good, reliable SSDs from companies like Micron and Samsung that can easily hang with their Intel competitors. And if you're willing to live on the bleeding edge for the promise of the absolute best performance, there's always SandForce. The client SSD space may not be mature, but I'm happy with the current state of things. With the exception of the ultra low price points, if you want an SSD, there's a solution on the market for you today. Going forward, I'm not expecting a ton of change in the near term. Intel's Cherryville SSD has been delayed. This is the long awaited SandForce based drive from Intel. I suspect the delay has to do with Intel working through bugs in SandForce's firmware, but its efforts should hopefully make the platform more robust (although it remains to be seen if any of Intel's efforts are ported back into the general SF codebase). In the first half of next year we'll see the first 20nm IMFT NAND shipping in client SSDs. The smaller transistor geometry will eventually pave the way for cheaper drives, although I wouldn't expect an immediate drop in prices. At the very least we'll see firmware updates enabling 20nm NAND support, although we may see the introduction of some new controllers as well. We're going to be pretty limited in terms of performance gains until ONFI 3.0 based controllers/NAND show up in early 2013. I expect the next 12 months to be more about driving enterprise SSDs and bringing down the cost of consumer drives. Now for the reason we're all here today. 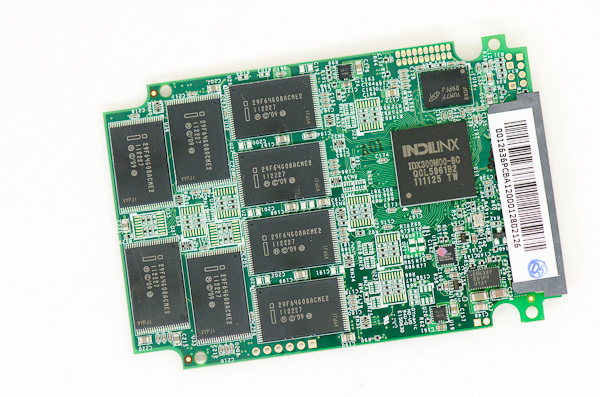 Earlier this year OCZ acquired Indilinx, one of the first SSD controller makers to really make a splash in the enthusiast community. 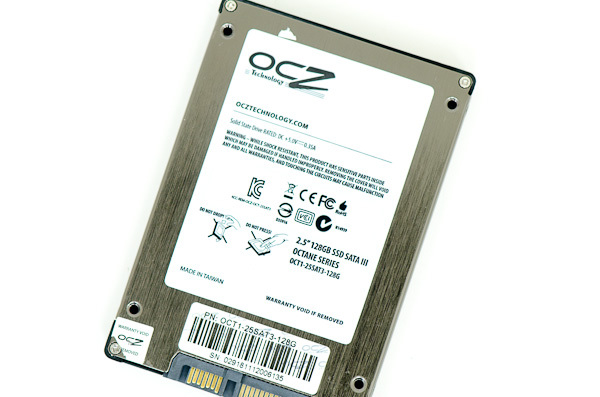 Ever since OCZ entered the SSD business it wanted to guarantee its independence by securing exclusive rights to a controller. OCZ initially did so by buying up all available inventory, first of Indilinx controllers, then of SandForce controllers. That strategy would only work for a (relatively) short period of time as the controller vendors sought to expand their market by selling chips to OCZ's competitors. A few slip ups on the roadmap and Indilinx was ripe for acquisition. OCZ stepped up to the plate and sealed the deal. 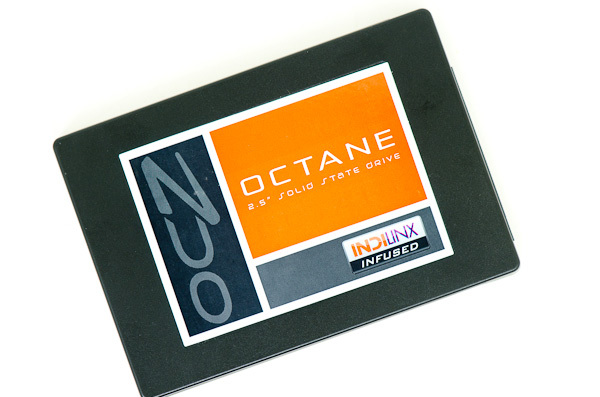 Several months later, OCZ debuted its first drive based on an unreleased, exclusive Indilinx design: Octane. Although Octane didn't set any performance records, it was competitive. Performance was definitely current gen, giving OCZ an in-house alternative to SandForce. There was just one issue: OCZ only sent out 512GB Octane review samples. SSDs get a good amount of their performance by executing reads/writes in parallel across multiple NAND devices. Higher capacities have more devices to read/write in parallel, and thus generally deliver the best performance. The greatest sales volume is of the lower capacity models - they're cheaper to own and NAND prices are falling quickly enough that investing in a 512GB drive rarely makes financial sense. 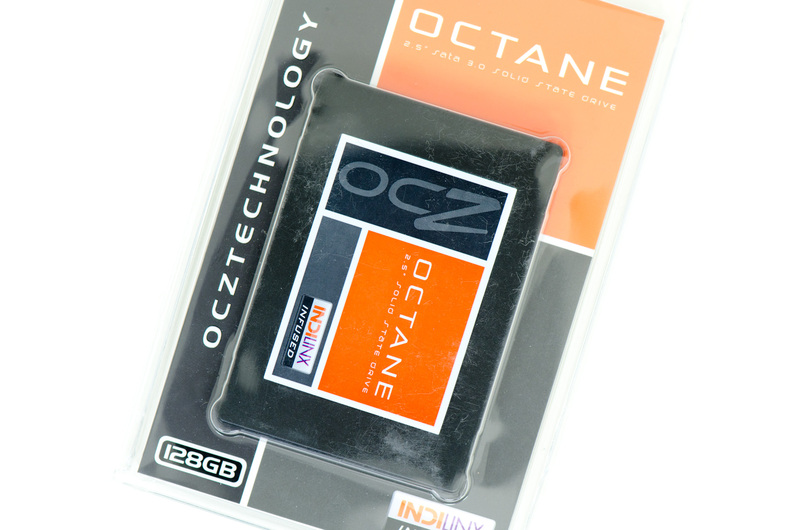 OCZ finally sent out a 128GB Octane, which I promptly put through our standard test suite. The drive still uses sixteen IMFT synchronous NAND devices. In this case each package features 64Gb (8GB) of 25nm MLC NAND on a single die. You may remember from our original review of the 512GB Octane that the Indilinx Everest controller supports 8-channels, but pipelining read/write requests to multiple devices per channel is supported. 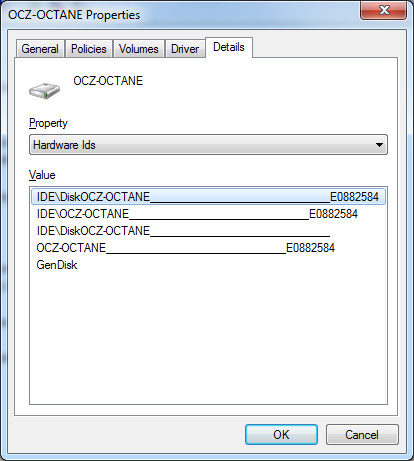 Gone from the Octane's PCB are the TI muxes that we found on the 512GB version. With the only difference between these drives being their capacity, it's likely that the muxes were used to switch between NAND die/packages. The 512GB version has 4x the number of NAND die than the 128GB version, and it's possible that the Everest controller is only capable of directly communicating with 16 or 32 die on its own. An external mux per channel would allow OCZ to scale capacities much further. The updated firmware doesn't do much for performance, although it does apparently fix a number of bugs that existed in the previous version. I haven't seen any mass reports of significant issues with the Octane, although it is still pretty new. Let's hope the trend continues. I second that. I'm glad you went with a lower capacity model. I wish you had included a first generation Vertex drive, along with a second for scaling. It may be SATA II, but I'm still using Vertex 2 drives and I would like to see just how modern drives compare.